ADJUSTABLE: to set them to your personal preference and to compensate for wear. TAILORMADE: not a copy of the original, but designed for a specific car or even conditions. IMPROVEMENT: individually tested until the optimum in handling and comfort is reached. INVOLVEMENT: KONI test drivers are dedicated car enthusiasts themselves. BUILT FOR A LIFETIME: a set of KONI shock absorbers will usually outlive your car. 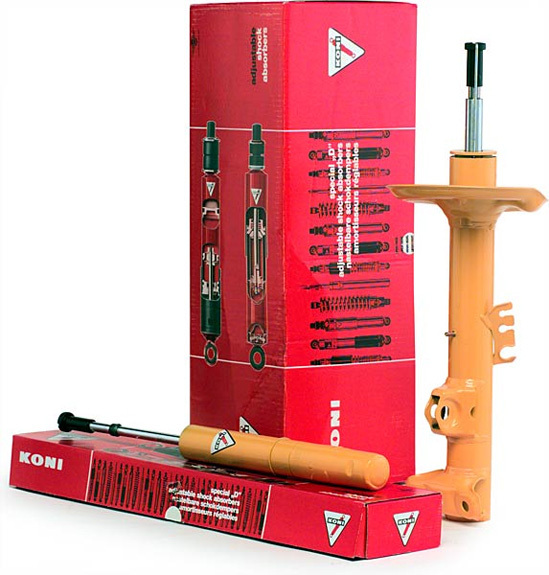 KONI serve sporting drivers with a carefully designed range of sport shock absorbers. This line focuses on exceptional road holding combined with an acceptable level of comfort. Its characteristics include responsive steering, reduced body-roll and limited body movements. Externally adjustable shock absorbers make fine tuning even more easy.